As a comprehensive rail systems integrator, Hitachi provides an array of environmental technologies, ranging from rolling stock to systems. Rail systems are a means of transport with lower CO2 emissions. Rail systems are becoming increasingly important as social infrastructure around the world because they have less environmental impact than other forms of transport and offer a mass transit solution. 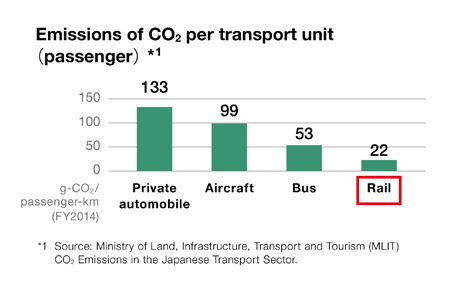 The CO2 emissions from railway systems per unit of transportation volume (people/km) is very low, about one-sixth of that from private cars, contributing to the reduction of risks from air pollution caused by exhaust from internal combustion engines. As a comprehensive rail systems integrator, Hitachi provides rolling stock, railcar systems and transport systems such as signalling and train management systems globally to customers in Japan, Europe, the Americas, India and Asia. Hitachi will contribute to energy saving by enhancing its products efficiency. Lighter than stainless steel rolling stock, A-train rolling stock saves energy in operation and can run at high speeds. It is also easy to recycle, enabling effective use of resources. Battery-powered trains that can run on non-electrified sections of track by using energy stored in batteries that are charged from the alternating current (AC) overhead lines or an internal combustion engine save energy compared to conventional diesel rail cars and minimize noise. Made from SiC (silicon carbide), SiC inverters save energy by cutting power loss and reducing equipment size and weight by 40%, thus helping reduce the weight of rolling stock. The regenerative energy storage system saves energy by storing reusable power generated when electric trains decrease their speed in storage batteries and using the stored energy during acceleration. The stored power can also be used to propel trains in an emergency.